[Free Pattern] Absolutely Stunning Purple Popcorn Afghan! You’ve probably heard about the Pussyhat Project. If you want to know the powerful story behind the Pussyhats at the Women’s March, you can read it here. 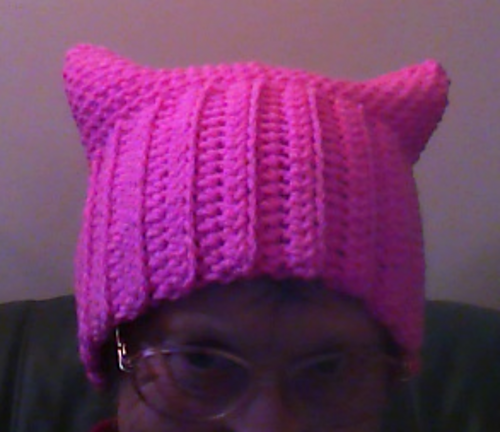 Symbol of sisterhood and solidarity, these little pink hats with cat ears are great to make a visual statement on the streets. They are also great and fun to make and wear in all other colors. 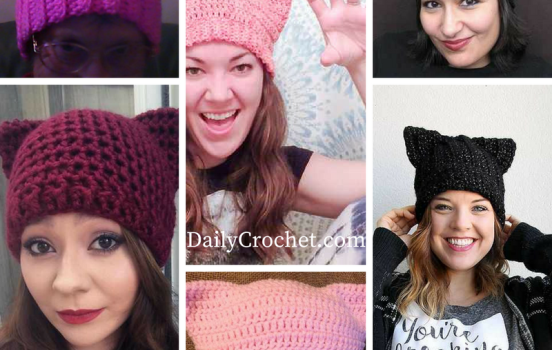 Here is a selection of 6 lovely free crochet patterns for cat hats with ears to choose from so you can make your own adorable cozy little pussyhat. To get to the pattern’s page, please click the name of the pattern you like. Image Source: Unwind Fiber Co. It really is a very simple pattern. You make a tube that fits your head, and seam across the top! Crochet this hat using any weight of yarn with the appropriate hook, then wear it with pride or gift it to a loved one, friend, or stranger. 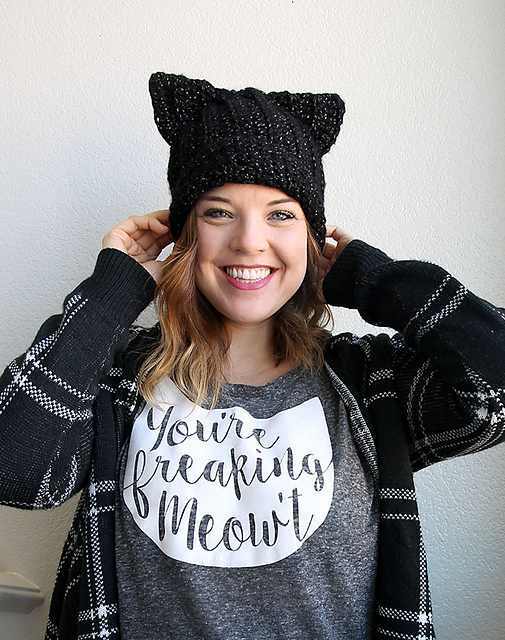 My Black Cat Slouch Hat has chunky ribbing and cute cat ears. 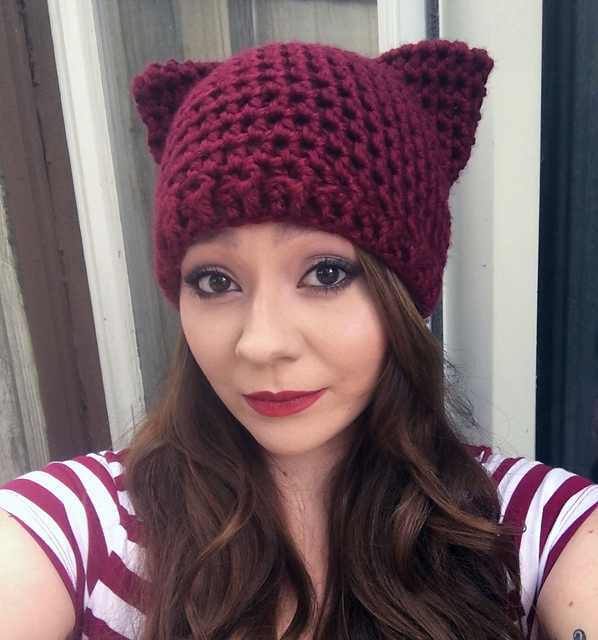 The simple and free Crochet Cat Hat pattern works up quickly and makes a great gift. The preciousness that caught my attention was the glow-in-the dark yarn that I’ve had for a while but didn’t have a clue what I should create with it. Inspiration came a-knockin’ my friends. Most patterns I’ve seen seem to be a simple rectangle that is folded over and sewn together; however, the ears never seemed to be cat-like enough for my taste. [Free Pattern] These Are The Best Looking Crochet Baby-Chucks I’ve Seen Yet! Bye daily crochet, you get political I unfollow you. Sadly, one seditious celebrity has ruined this look for us all. Have you got any OTHER cute animal hats in your bag of tricks? I am by no means stating my political party, but any way you slice it, these hats stand for a despicable purpose. Absolutely vile. Thanks for posting this. Sorry you’re getting so much negative feedback. These hats, and what they now stand for, are fantastic! Thank you for posting these! Awesome!! Thank you for sharing! Sorry for the negativity. It’s easy to discredit and insult what doesn’t affect one individually, and what they don’t understand! You just had to go there. I have left two crochet pages over this stupid hat because it invariably “starts” things. I see enough politics in my feed as it is! Thank you so much for the patterns. Ignore the thin skinned posts. It’s a pattern of a hat that has been around long before now. I see what you did there! Hahaha! Rock on! Sorry, this is a very cute hat pattern but it is completely tainted now. 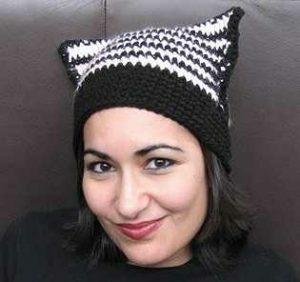 I love crocheting and I love cats, but those are the ugliest hats I’ve ever seen and stand for something even uglier. I need to wipe it out of my mind or I might never crochet without thinking about it ever again…people sure know how to ruin a good thing. I’m sitting here confused as well. Cute hat, you don’t have to use pink! Pink hats with cat ears were a symbol of the Women’s March on Saturday. Awesome and you can make them to fit your personality and still share in the movement and statement! Sorry to read about the negative feed but we all must stand together now and for our future daughters and sisters! Making my hat now!! Thanks for sharing, ill have a hat for April! Just like I’m sure not everyone who supports Trump is racist, not everyone who opposes him agrees with this nonsense. 🙂 peace!!! Wow – I think they are cute and the message appropriate. : ) There is much love in sharing. Preach love and push hate is a terrible message. Wearing a hat that is meant to “stick it to the man” in reference to$#%&! @*grabbing is making a great statement to your daughters. Wonderful. And we wonder what is wrong with our youth? 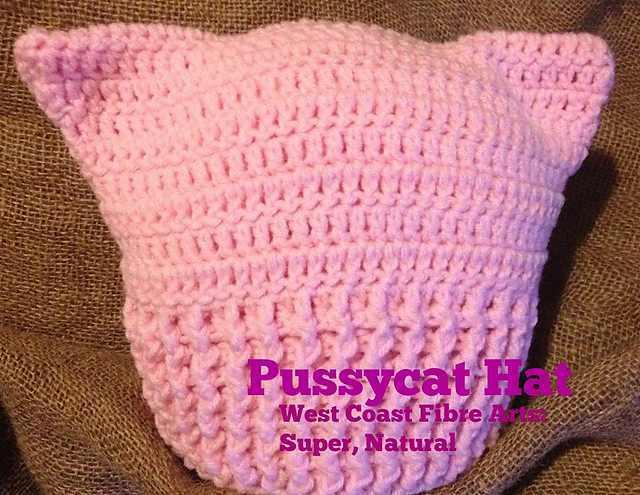 I use to think they were cute, but the little pink march women did with these kitty cat hats on as their symbol, not a chance, they stand for very vile, pigs who call themselves women. Actually, I’m a lovely person. Polite, kind, moderate, and I have very nice manners. Thanks for judging me, though. Funny, I don’t recall any of that actually happening at the march I went to. I absolutely love them. Why is it no-one has a sense of humor anymore ? People need to laugh more and stop thinking of everything as a political statement. I think the real pigs are the women who feel the need to tear others down. Sadly there is a lot wrong with our youth, but a hat is not the reason our youth has issues. The high crime rate and drugs are some of the issues. But sure an innocent pink hat is whats causing the issues. Why would I be wearing a$#%&!@*hat . Unfortunately, this design has devolved into a statement demeaning to women and girls. Update: if you are not concerned over the statement made by Donald Trump, that he could grab women by the$#%&! @*but you are somehow bothered by other women wearing little pink hats. YOU HAVE A PROBLEM and I would suggest you get MEDICAL HELP while you still have HEALTHCARE! Lisa Benecke If you were out supporting this vile mess, I am just sorry for you. Imagine taking your daughters to this pig fest. The hat is not the issue. It is what this hat stands for. I am not condoning what Trump said, but at the same time harping on the statement and preaching it and conjuring up more hate is the issue. Nanette K Brose Would you take your daughter to this? Sorry sweetheart, I couldn’t accept the vile filth it represents now. They used them to refer to their private parts. I would’ve chosen a different colour and a different name for these, if it had been up to me, but I totally support the cause and thank you so much for this post! Sorry for all the negative comments on here, hope they’re not getting to you. Never really wanted to learn to knit until now. Lack of understanding is involved here but not the way you imply. 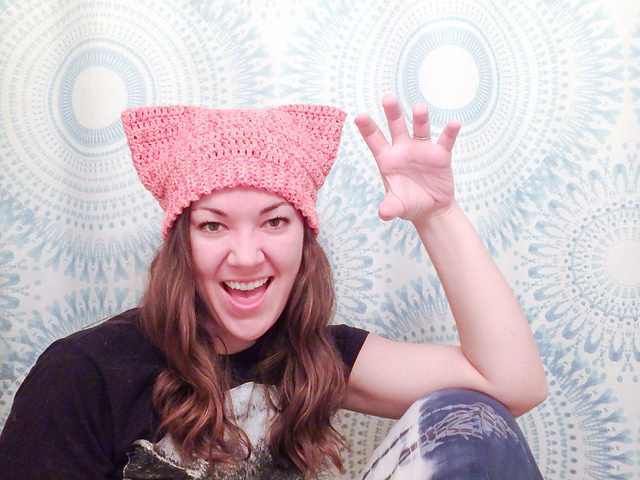 I’m wondering if all the negative comments are based on lack of understanding what the Pussycat Hat movement is about? I sincerely hope everyone has a wonderful day creating whatever crochet project that makes you feel the happiest. Peace. Exactly the way I imply! Sylvia. In not sure who was pushing hate? Or,are you? They are cute hats unfortunately were high jacked for debasing farce of a march. The fact that they were used to represent a false women’s rights movement saddens me. Although it does make me want to get creative to do something to support the real women’s right cause that are out fighting against sharia law, honor killings, female mutilations and oppression of women. I didn’t know why all these women were wearing “hats with horns” at the March. So…. I was at bell choir practice at church. During prayer circle, someone mentioned the Women’s March…I blurted out “What’s up with the stocking caps with horns?” The lady who went to the rally got a rather mortified look on her face and said she probably needed to tell me privately. A couple other people mumbled something…Finally she said it had something to do with Trump and someone else said they were cat’s ears. A light went off in my head….Really…who would wear something like this. And this all happened at church! People want censorship. Don’t like the hats..don’t make them! I’ve made 40 (and counting) of these so far and only one person has turned me down (politely). Katelyn George a slightly easier cat project for you…. Jasmine LeCount omg I sooooooo want one!!! I’m not going to unfollow because everyone is entitled to their opinion on this cat hat. I’ll have to note in my blog about this site that they might find some of the content of this site offensive. Yes, you are entitled to your opinion but some will find this content offensive. It’s just a fact.